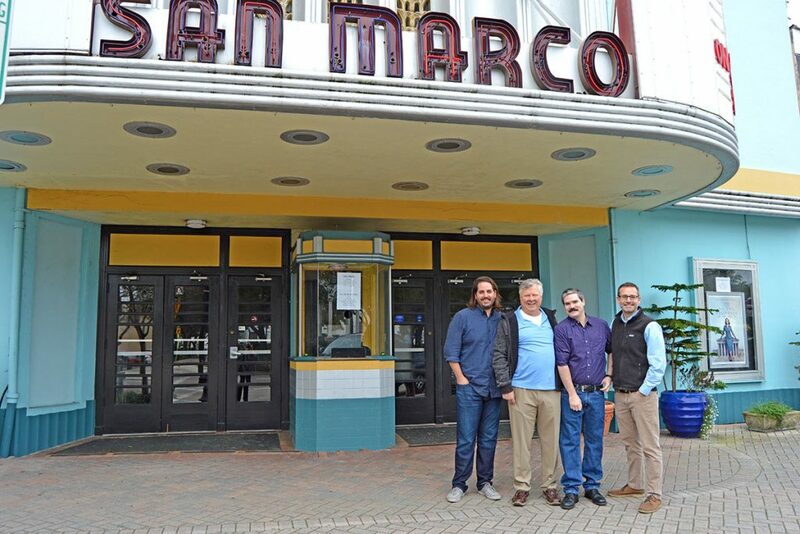 Four from San Marco purchase historic movie theatre - The Resident Community News Group, Inc. | The Resident Community News Group, Inc.
Jonathan Davis, Frank Sanchez, Andrew Oetjen and Ryan Davis are the new owners of the San Marco Theatre. The historic San Marco Theatre, which is commonly considered to be among of the 10 best classic theaters in America, has been sold. In what was described by the new owners as a case of “the seller handpicking the buyers,” the torch of ownership of the iconic 81-year-old San Marco landmark passed on Jan. 4 from long-time proprietor David Blue to four long-time San Marco residents and local businessmen – Frank Sanchez, San Marco Theatre Manager Andrew Oetjen, and brothers Ryan and Jonathan Davis. “It is a bittersweet decision because I have very much enjoyed my time at the San Marco (Theatre), interacting with you wonderful folks and my forever young staff,” wrote Blue in an email to Joel Embry and Ginny Myrick, who passed it along to The Resident. Franklin Delano Roosevelt was president when renowned local architect Roy Benjamin designed the art deco theater in 1938. Built by the E.J. Sparks group, which owned 100 movie theaters in Florida, the San Marco Theatre accommodated 500 patrons, and had operating equipment in its projection booth considered to be among the most modern and finest in the country, according to a June 4, 1938 article in the Florida Times-Union. Described as the “finest picture house in the South,” on the theater’s opening night, then Jacksonville Mayor George Blume purchased the first ticket and former Jacksonville Mayor John T. Alsop assisted in operating the modern picture equipment during its first showing, which was a double feature – “A Slight Case of Murder” with Edward G. Robinson and Jane Bryan, followed by “Hopalong Rides Again,” starring William Boyd, according to the article. Since then, the theater has thrived under the tutelage of at least three owners, carving out a special place in the hearts of many San Marco residents. Ryan Davis recalled his wife, Leighton, viewed her very first movie within the theater’s hallowed walls. “She grew up in San Jose and came here when she was growing up. I think she saw her first movie here. It was ‘E.T.’ and she cried hysterically,” he laughed, noting he also took his wife to the San Marco Theatre many times when they were dating. All four of the new owners said they are avid movie buffs, frequenting the theater before they owned it, sometimes as often as once a week. Because they appreciate what a “gem” the theater is, is the big reason Blue sought them out as potential buyers, said Ryan Davis. For all intents and purposes, Blue got his wish. Jonathan Davis owns Stowmarket Holdings, dabbles in real estate and is currently rehabbing two San Marco apartment buildings with his partner, Sanchez, who owns limited partnerships in both Town Hall, and Grape and Grain, and is CEO of a new Southbank banking software firm, Finxact, Inc.
Ryan Davis owns Piper Homes, a residential construction company that often works in Jacksonville’s historic communities. He occasionally works on projects with his brother and is a member of the city’s Historic Planning Commission. Sanchez also added that Amaretti’s Bakery will continue to sublease a portion of the building in front of the theater’s second screen, giving movie-goers another option when it comes to selecting sweet treats to munch on in the theater. “We have the best customers in the world. The only suggestions we’ve heard so far are what kind of movies people want to see,” he said. “David’s advice to us was, ‘I know you are going to come in and try things out and make small changes. Some of them will work and some of them won’t,’ but he encouraged us to have fun with it,” said Ryan Davis. Jonathan Davis agreed. “I think the most exciting part of this for me – honestly, my hair stands up on end just talking about it – is that I can’t believe we as an eclectic group own the San Marco Theatre. My office has been in San Marco Square for seven years, and I would walk by it every day, look at it and say, if there’s one business I would want to own in San Marco Square it would be the theater. But it felt far-fetched, like something that could never be reality. It was a dream. Now I know we are going to have a lot of fun because we get to own a movie theater,” he said.